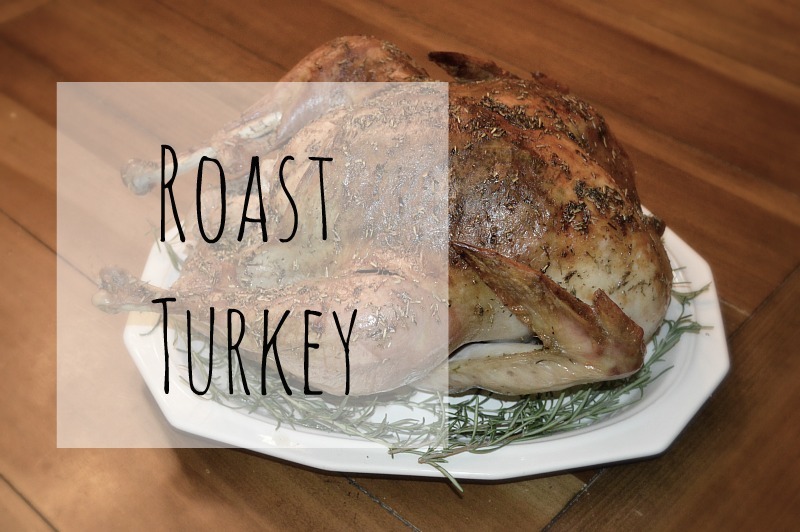 With so many different techniques and flavor combinations, the thought of roasting a turkey can be overwhelming. 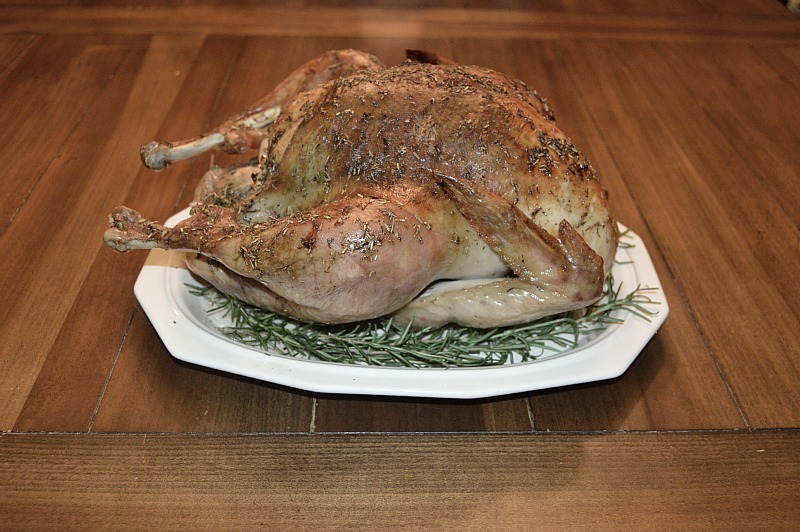 This recipe is a fairly simple way to a fool-proof roasted turkey. This is the first time I prepped the turkey with a 24 hr brine solution and I think it made a huge difference! If you don’t have time or don’t want to you can skip that step. I used a roasting pan and mostly fresh herbs and butter. Keeping it simple and not overpowering with a certain flavor helps the turkey pair well with almost any side. I use it around the holidays when you may have lots of different food combinations. First thing you need to do is follow the package instructions on the turkey for thawing time. If your turkey is not frozen keep in refrigerator until ready to cook. If it is frozen make sure you take it out in enough time to thaw. Usually it is around three days, depends on how many pounds the turkey is, it may require more. The brine solution can be done in many ways. 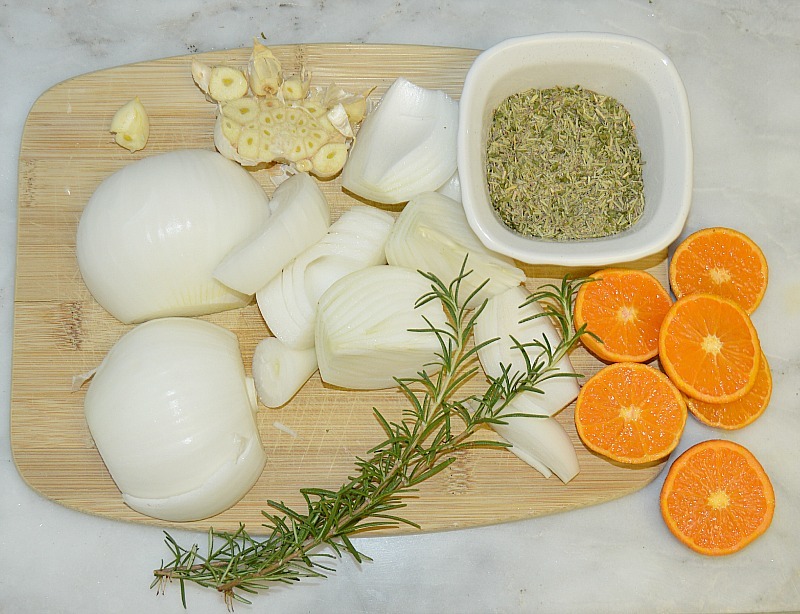 An easy way to have a good brine is balance of water and flavors. You want to have a salt water like solution which the meat will absorb. Remove any giblets or neck form turkey. I did this in a large bucket, added water and mixed ingredients until dissolved then placed turkey in solution. I covered lid with plastic wrap and refrigerated overnight. You can add as little or as many ingredients to the solution. I suggest try new ideas with different seasonings to see how unique you can make your turkey come out. 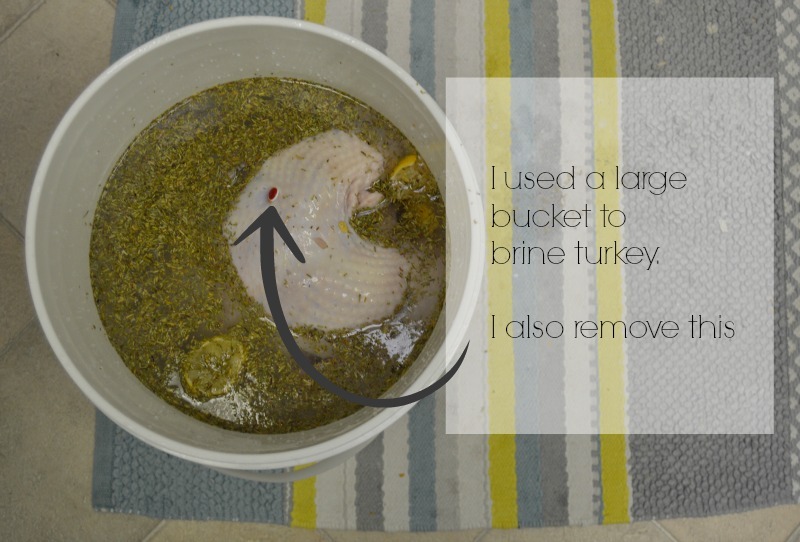 Using a brine will help the turkey retain moisture throughout the long cooking process. Place turkey in brine solution overnight for best results. Before you go to cook your turkey rinse off brine solution completely and pat dry. If your turkey comes with a pop-up timer that is supposed to pop when turkey is ready, I throw it out. 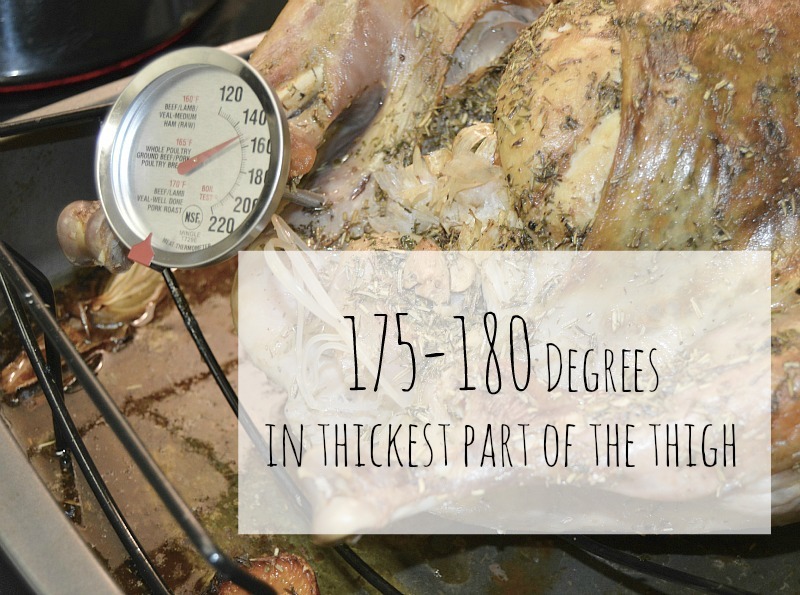 The best way to have an accurate reading if the turkey is done is by a meat thermometer. They are inexpensive and easy to use with indicators that will help you know what temp to look for depending on what you are cooking. Rinse turkey and pat turkey dry, either out of the package or out of the brine solution. Place turkey on rack of roasting pan or in a large deep pan. Melt butter and spread over turkey skin completely covering turkey. You can also lift skin on the breasts and make a pocket between breasts and skin. In a small bowl place salt, pepper, rosemary, thyme, and parsley and mix well. Sprinkle over turkey, it should stick to the butter. Place seasonings under the skin and onto the breast areas or anywhere you want to cover. Place in oven at 325 degrees, and follow cooking instructions on purchase label. I didn’t have any fancy cooking twine to tie the legs this time, but that is okay because you don;t have to have it either. What tying the legs does is help position the turkey so that it will cook evenly. First, have all of your seasonings ready. I like to have anything that will be seasoning the turkey out in separate bowls. That way you keep everything clean, reach for more without contaminating any spice containers. Anything I don’t use I discard. 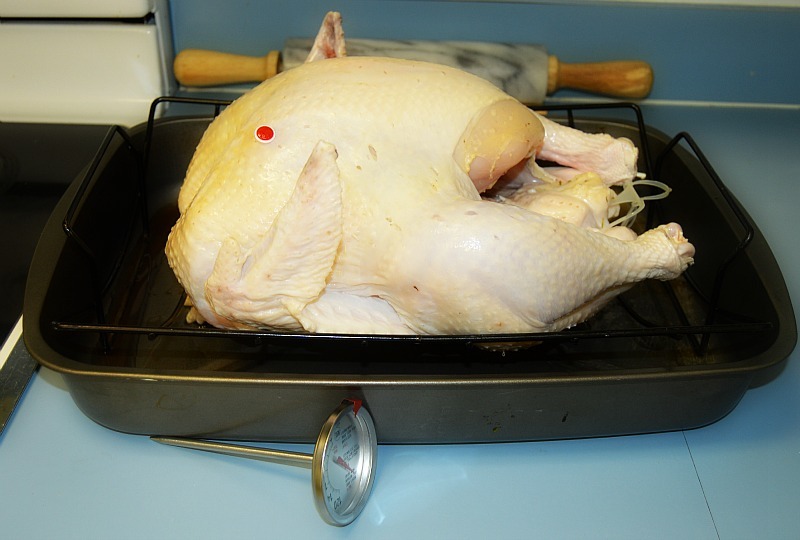 Like I mentioned earlier, I take the pop-up timer out of the turkey and use a meat thermometer like the one in the photo. I would also recommend a good quality roasting pan for best results. Or, a deep baking dish works well. The one in the photo worked well, but I recently threw it out. It was very cheap and the outer coating was coming off the rack, no good. I am currently on the look for a new one. Pat turkey dry, place on rack of roasting pan and begin to season. If you used a brine, be careful not to add too much salt. This is what I did. I melted unsalted butter and spread over entire turkey, then made pockets under skin of breasts and placed butter on top of and under skin. I then make a bowl of mixed spices, all the salt, pepper and herbs, and sprinkle on top of all buttered areas including pockets between breast and skin. I then sprinkle the last of it inside of the turkey with seasonings, then finish by putting onions and lemons inside turkey. You can place stuffing inside instead, I prefer to cook stuffing separate. I have always had guests that don’t want stuffing that was inside a raw turkey, so I got used to cooking it separate. 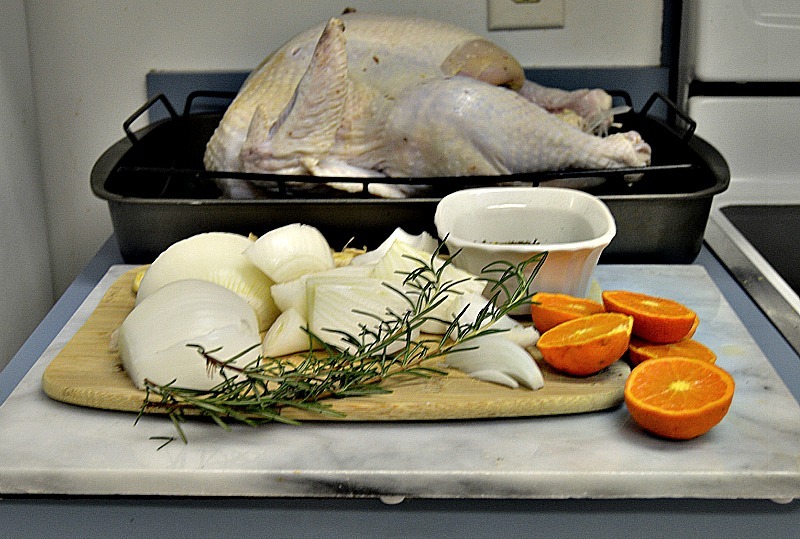 The oven temp would get rid of any bacteria that might be in the raw turkey. A lot of people enjoy a flavorful stuffing that was cooked inside a turkey, it’s mainly just a personal preference. Once turkey is seasoned and ready for the oven, place in oven on a low rack position so the turkey is in the middle of the oven. Bake at 325 degrees or follow baking instructions on purchase label. I usually use lemons on a turkey, but his time I tried these really juicy oranges that I had on hand. It came out good, my next attempt will be using a lime. A lot of people recommend to poke holes in the lemon or citrus fruit, I simply cut in half and place inside and around the turkey. Follow instruction label for proper cooking times. Usually you determine cook time by pound. The purchase label will instruct you how many hours per pound you should allow. Always monitor, bast and keep an eye on the turkey. After an hour or two, I usually start checking temperature. Every oven is different, you never know when the turkey may cook faster than you thought. You will want to check the temp in the breast and in the leg. 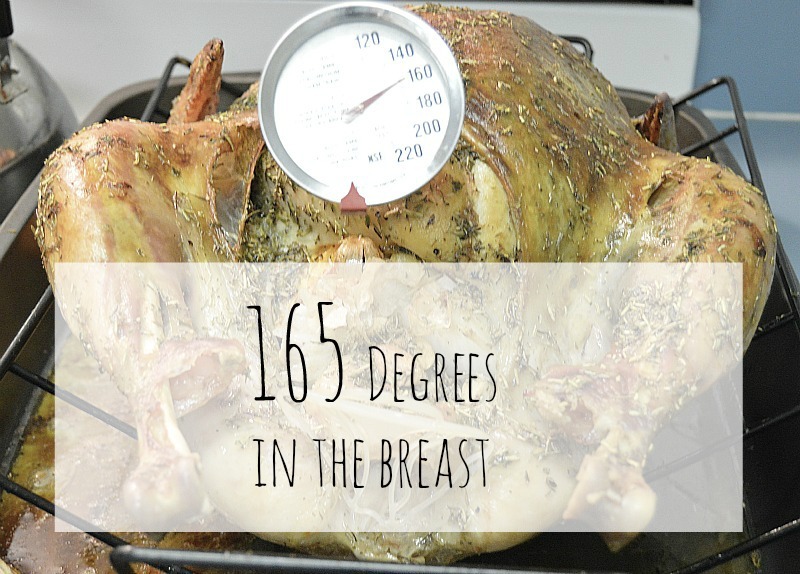 The breast should read 165 degrees. The thigh should read 175-180 degrees. 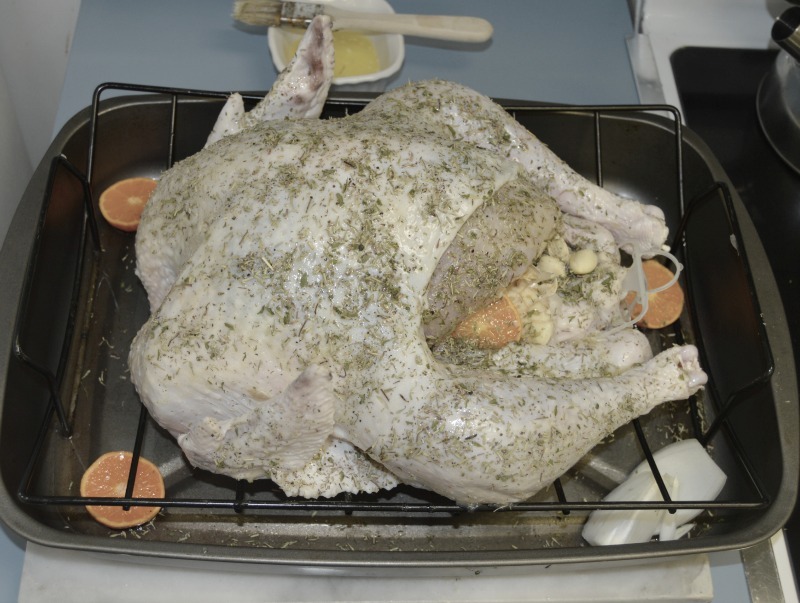 Once turkey is desired temperature remove from the oven and cover turkey with foil. I like to let site for about 30 minutes before carving. Now you can enjoy! For presentation purposes…I think I need to tie the legs next time…I think someone might have snuck a bite off the leg.